Members of PutneySW15.com can win a VanGu print. Q: What art movement inspired Uli's "defragmentation" style? Uli Larosa, Photographer, born in Italy, lives and works in the UK, having been an SW15 resident for the past five years. Uli works at the Financial Times and runs a photography business, signing his photos with the nick-name VanGu. "There is a funny story behind the name of my business. My close friend Ben, who I used to share a flat with in Putney, started calling me Gu because of my passion for the chocolate company, then as I started working on my photography projects, to tease me, he started calling me VanGu as for VanGogh. The name stuck with me and VanGuMedia is now my brand." "I love living in Putney it is such a gorgeous area. I live by the river with my wife Tanya and we are expecting our first child in January 2011." "My main style, which I call defragmentation, is inspired by the Cubism art movement. Cubists expressed their paintings by showing different views of an object put together in a way that you cannot actually see in real life." "Last year I took on a project that I entitled "Putney Toy Town" where I used a different technique to my usual style. 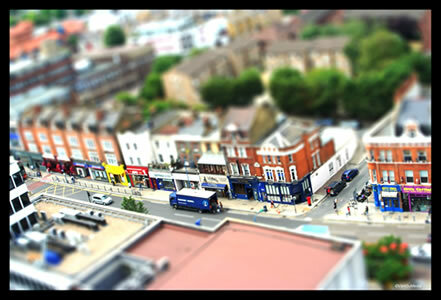 The technique is called tilt-shift and it simulates the effect of looking down on a miniature. I am very proud to have received so much recognition from people in Putney and worldwide. There is something magical about seeing your own town under a different light. I have to thank the management of the Putney Wharf who let me work from their building, giving me access to the fantastic penthouse." Some of Uli's work, of both styles (Defragmantation technique and Putney Toy Town), are now available to be purchased directly from his website (vangu.vpweb.co.uk) or at the Pryor Bank Café in Bishops Park near Putney Bridge where his work is exhibited. Pryor Bank Café is a registered charity which supports and houses vulnerable and disabled ex-servicemen and women. Part of the proceeds from the photos purchased will go to the charity. People can also visit and add me as friend on Facebook (Vangu Media London). 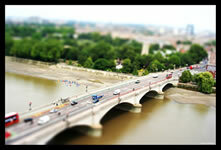 "Some lucky people had the chance to buy my limited edition "Putney SW15 Calendar 2011" that I have produced using some of the Putney Toy Town photos. Some of the calendars have been sent abroad (Italy, China, France and Canada). 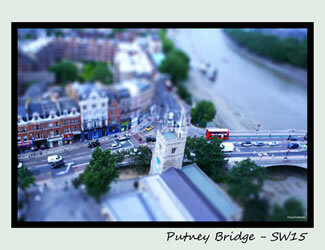 I have produced some postcards of Putney that can be also purchased." "I also take bookings for events or family portraits. I have so much fun working in Putney; there are so many great places to discover every time you take a walk by the river or just near the highstreet. There is so much intensity in colours and beauty from the changing of the seasons. There is a great atmosphere in the football games, the boats and the rowing races. All this is magical Putney and I hope that some of this magic and passion for my town transpires through my photography." "My next project is to capture more people's stories and some of the changes that are happening in our area. I would be happy to hear from people who might have some interesting stories to tell or who are working on a special project that they would like to be captured artistically."